Trumpf debuted its modular TruPunch 1000 and TruMatic 1000 fiber (pictured) punch-laser machines to the North American market at FABTECH. With its expandable functionality, the TruPunch 1000 punches sheets to 0.25 in. thick at 600 strokes/min. 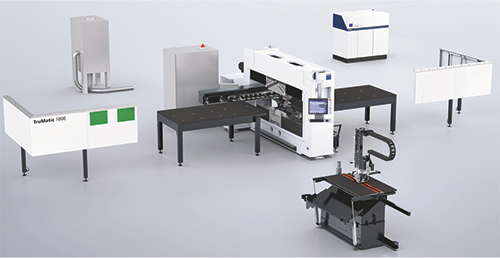 Its modular design enables the TruPunch 1000 to transition into the new TruMatic 1000 fiber by adding a 3-kW TruDisk solid-state laser, as well as a laser-cutting system, a laser evacuation unit and a beam-guard system. The machines offer a completely redesigned drive technology, dubbed Delta Drive, to move the electric punching head and the laser along the Y axis while the sheet moves in the opposite direction. Powered by two servomotors, this arrangement enables the machine to accelerate far faster in the Y axis and eliminates the need to move the sheet or worktable. Also included: automatic sorting of finished parts to 7 by 7 in.—parts move sent down a chute and can be sorted into a series of four boxes positioned below the machine.